“Dad’s Army” was the fun theme of this year’s Welly Challenge, the club’s annual fundraiser for charity. The characters who arrived at Mead Hall in Wheathampstead, included a grimy Bevin Boy, Captain Mainwaring himself, a Red Cross Nurse, a Parachute Regiment soldier, three Land Army Girls complete with forks and “Dig-for-Victory” veggies, a ‘40s Housewife with saucy bloomers and a broom, two female Aircraft Mechanics, an Army Officer, an injured War Victim, an ARP Warden, a Naval Captain with a chest full of medals, and an 8th Army Desert Rat. There were also several undercover spies (the Hunt Family?! ), and a French-speaking member of the Resistance, the glamorous Madame Shaw. It’s entirely possible the other low key disguises in the room were infiltrators of some sort! MC for the evening was, as usual, the irrepressible Roger Morse. He took us on “a tour” of the fancy dress outfits, guided us through the quizzes, and got everyone playing a balloon game designed to transport a wartime message from A to B in the shortest amount of time. A special attraction of the evening was the Memorabilia Table which contained lots of artefacts brought in by Wellys, such as a genuine stirrup pump donated by Mike Fairman, medals, newspaper cuttings, and photos. There was even a 1944 utility wedding dress complete with wadding round the hem belonging to Val Newton’s mother. Val was persuaded to put it on and give an impromptu floorshow, much to the delight of everyone. Graham Hunt’s daughter Louise did a great job with the raffle, and the final tally of money raised came to £257.45, which will be donated to the Help for Heroes charity. 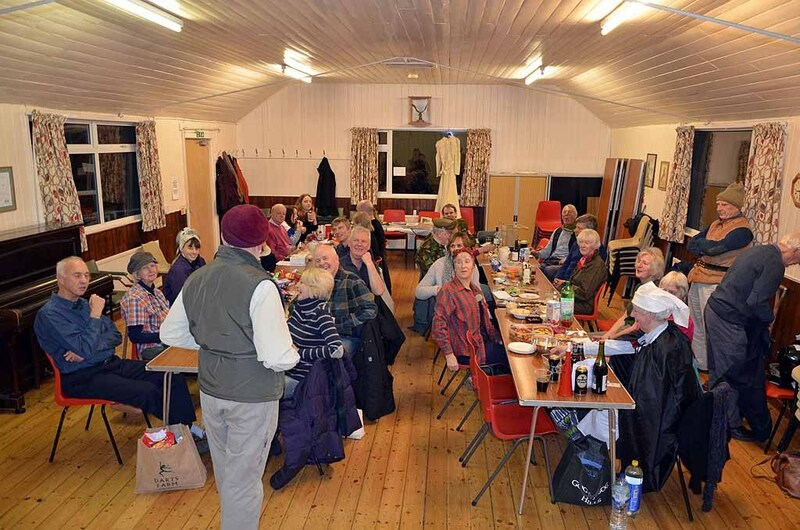 A big thank you goes to Roger Morse for a super evening, to Pete Thornley for his quiz, the Cardinals for the magnificent trug of veggies, and everyone else who donated raffle prizes and their time and inspiration. Frazer: Captain Mainwaring. Did I ever tell you the story about the old, empty barn. Frazer: Would you like to hear the story about the old, empty barn? Mainwaring: Um. Yes. Listen everybody. Frazer's going to tell us the story about the old empty barn. Frazer: Right. The story of the old empty barn. Well. There was nothing in it.